Over the past years, you may have heard me refer to the many stories of the Rebbe, his neighborhood of Crown Heights, and the nerve center of Chabad: “770.” There's a reason why these themes keep on coming up. This is where Layah and myself receive our inspiration to fulfill our service and work here in the community. 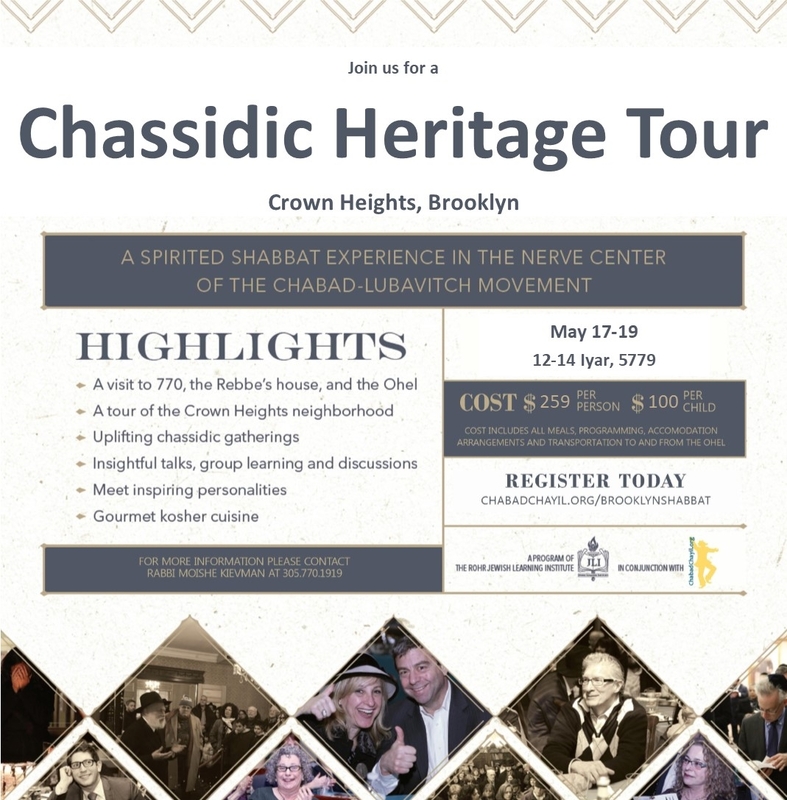 Instead of just hearing about Crown Heights from me, why not join me and the community in a group trip to New York, to where it all began: to the “engine room” of Chabad, Crown Heights, Brooklyn. On Shabbat, (May 17-19), against the backdrop of this neighborhood saturated with Jewish life, The Rohr Jewish Learning Institute is organizing an unforgettable weekend experience. Shabbat in the Heights features amazing speakers, insightful learning, a chance to meet local Crown Heights personalities, tours, and a visit to the Rebbe’s resting place. The program will run from Friday until Sunday and includes all meals with world-class kosher food. You probably know that Crown Heights is the heart of the Chabad Lubavitch movement and home to thousands of its followers. It’s become famous as one of the most warm and welcoming communities in the Jewish world. The locals open their houses to visitors from across the globe, urging them to step inside and feel at home. Spending a Shabbat weekend in Crown Heights has become a must-do experience that creates lifetime memories. The Shabbat weekend is May 17-19, 2019 and is open to both men and women, singles or married couples.